Before the work began, a coffer dam had to be built to protect the temples from the rapidly rising water. Then the temples were sawn into blocks, taking care that the cuts were made where they would be least conspicuous when reassembled. The interior walls and ceilings were suspended from a supporting framework of reinforced concrete. When the temples were reassembled, the joins were made good by a mortar of cement and desert sand. This was done so discreetly that today it is impossible to see where the joins were made. Both temples now stand within an artificial mountain made of rubble and rock, supported by two vast domes of reinforced concrete. 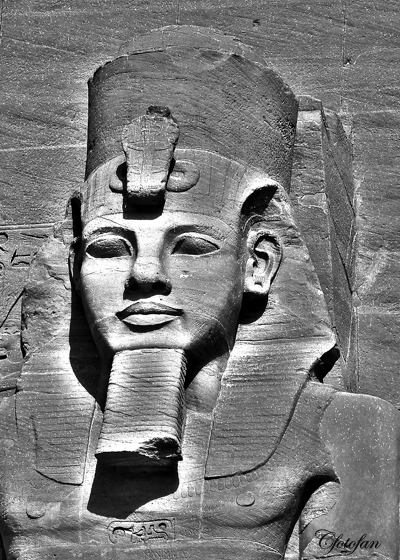 This entry was posted in captures, cultura, culture, diversión, exposición, fotografías, fotos, fun, gallery, historia, history, Images, imágenes, photos, pictures, ruinas arqueológicas, travel and tourism, turismo, UNESCO and tagged Abu Simbel, ancient Egypt, antiguo Egipto, Egipto, Egypt, Ramses II. Bookmark the permalink.